UK pop punk with teeth. Increasingly, there seem to be two types of punk bands coming out of Britain – those who invest everything in the scene’s roots, dismissing all those outside it as unworthy, and those who are keen to reach a wider audience. Sharks are firmly in the latter category, and they approach their first album with a melodic flair and grace that suggests they’ll reach their goals without too much trouble. The influences are clear – The Clash are their granddaddies, but Alkaline Trio are their older brothers, their dark, gothic take on pop punk apparent in James Mattock’s vocals and deft lyricism. But it’s their love of an anthemic chorus that really sets them on course for a festival-beating summer, with Arcane Effigies echoing the life-affirming effervescence of Ash, and the nostalgic classic radio rock of Gaslight Anthem on Able Moving Hearts. The production shines too, with the gleaming horns of Patient Spider seeming to urge the band out into the mainstream. 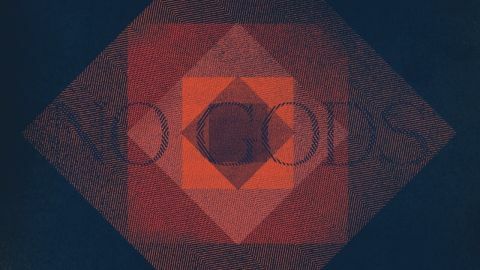 For an album that has such a nihilistic title, No Gods is actually an overwhelmingly positive listening experience, and it’s one you sense plenty of people will fall hard for over the coming months.